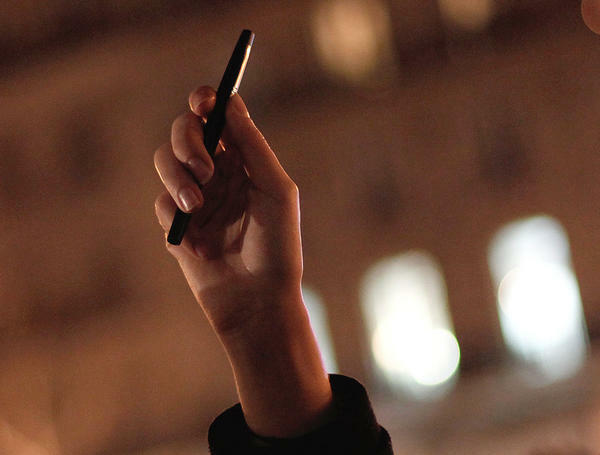 In Paris late Wednesday, a woman held a pen in the air during a memorial. Hundreds gathered to show solidarity with the cartoonists at Charlie Hebdo, where gunmen killed 12 people. The cartoons of the Prophet Muhammad that Charlie Hebdo posted in recent years are part of the story of this week's attack. In 2011, as The Two-Way has noted, the magazine's offices "were firebombed after it published an issue that invited the Prophet Muhammad to be guest editor; the issue included an article about what a soft version of Sharia might look like. The magazine was renamed Charia Hebdo for the issue, and its cover included an image of the prophet with the line, 'A thousand lashes if you don't die laughing.' "
In a video taken at the scene Wednesday, one of the attackers could be heard shouting "We have avenged the Prophet Muhammad." Witnesses have said the men also yelled "Allahu Akbar," (Arabic for "God is great"). But just because offensive images are part of a story does not mean a news organization must publish or post them with its news reports. In this case, posting just a few of the cover images of the Prophet Muhammad that Charlie Hebdo published could be misleading. The images the magazine has put on its cover, for example, might be less offensive to some viewers than the more graphic cartoons that have appeared inside the magazine. Those include caricatures of a naked prophet. Photos showing just a few of the magazine's covers could lead viewers to mistakenly conclude that Charlie Hebdo is only a bit edgier than other satirical publications. But a comprehensive display of Charlie Hebdo's work would require posting images that go well beyond most news organizations' standards regarding offensive material. At NPR, the policy on "potentially offensive language" applies to the images posted online as well. 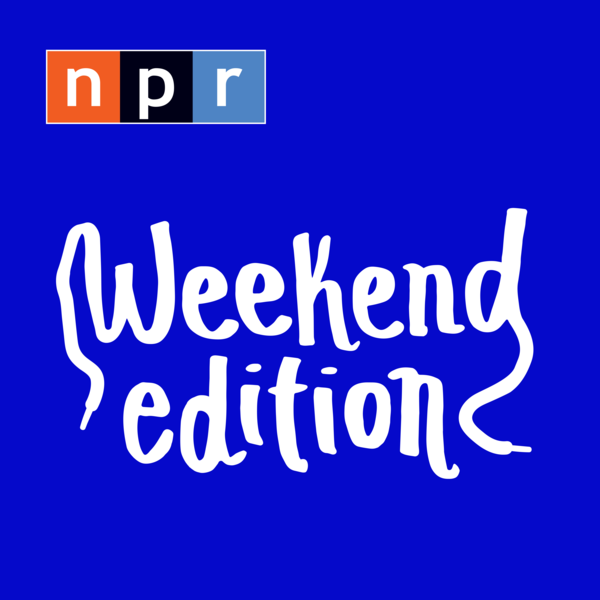 It begins by stating that "as a responsible broadcaster, NPR has always set a high bar on use of language that may be offensive to our audience." At this time, NPR is not posting images of Charlie Hebdo's most controversial cartoons – just as it did not post such images during earlier controversies involving the magazine and a Danish cartoonist's caricatures of the prophet. The New York Times has taken the same position. The Washington Post's editorial board has put one of Charlie Hebdo's Prophet Muhammad covers on the print version of its op-ed pages, but not online. News editors at NPR and other organizations continually review their judgments on these types of issues when the materials are potentially offensive because of their religious, racial or sexual content. That review process will continue. News organizations have also this week debated whether to post or publish some of the shocking images and videos that surfaced after the Charlie Hebdo attack. One video in particular sparked discussion in newsrooms. It shows a gunman shooting and killing a Paris policeman as the wounded officer lay helpless on a sidewalk. Out of respect for the officer and for those in the audience who would find the video disturbing, NPR has chosen to describe what happened rather than to post the video. Mark Memmott is NPR's standards and practices editor. He co-hosted The Two Way from its launch in May 2009 through April 2014. The attacks in Paris this week raised a range of questions for news organizations, in a time when images stream across the world unedited, unverified, but instantaneously. And of course, the cartoonists and editors at Charlie Hebdo were apparently killed because of the images they ran in their magazine. Mark Memmott is NPR's standards and practices editor. Normally, we talk to him about words. This week we also want to talk to him about images and the decisions that are made. Mark, thanks for being back with us. MARK MEMMOTT, BYLINE: You're welcome. SIMON: At week's end, there were a number of editorial voices who were calling on news organizations to run copies of the cartoons that were in Charlie Hebdo. Reporters Without Borders - I'll read a quote from Jeffrey Goldberg, who said on The Atlantic website. (Reading) To publish the cartoons now is a necessary, but only moderately brave act. MEMMOTT: I understand their position. We have not published the most graphic cartoons. We have not published any of the images of the prophet Muhammad, for instance. We just, in the end didn't feel we could do justice to what Charlie Hebdo has done over the years and give people a true picture of the kinds of cartoons it had put out. If we didn't put out a lot, that would really bust our standards, not just bend our standards, but bust them. MEMMOTT: No. We edit - or, we censor, if you want to use that word - all the time. There are images, videos, sounds that we just don't think people want to hear, that will offend them, that will shock them. And in this case, many of the editorials, many of the cartoons that Charlie Hebdo has done over the years would do just that. And we feel we can stand up for their right to publish them. We believe in their right to publish them. We don't necessarily, though, have to republish them ourselves. SIMON: Do news organization sometimes have to shock or offend to tell a story? MEMMOTT: Yes. Yes, there are times. There are times we've put words on the air that we really shouldn't because it was imperative. There've been instances where expletives got on because it was during war and a soldier accidentally slipped, things like that. But in this case, do the people who are shocked and horrified by what happened in Paris need to also be shocked and horrified - as many might - by the cartoons that Charlie Hebdo ran over the years? Probably not. I think you can hold both opinions. You can be offended by what they did and be horrified by what the killers did. SIMON: There are ways to see the cartoons. MEMMOTT: There are many ways to see the cartoons. We're not denying anybody anything. They're all over the Web if you want to find them. SIMON: This is less a decision motivated by concerns about safety than an editorial judgment. MEMMOTT: Yes. No news organization could seriously say that it doesn't think about the safety of its journalists, when these cartoons might've been the cause for the firebombing of Charlie Hebdo's offices a few years back and the murder of its staff this week. But, we're journalists. We're willing to take risks. We know that sometimes we'll have to. Editorially, we just didn't think that we could post enough of the images to give you a sense of what the magazine was really like. If you only put a few, it might look like it was just little bit edgier than MAD magazine, and that's just not the case. SIMON: And finally, is this or any standards and practices policy the last word? MEMMOTT: No. We revisit these things all the time. There may come a moment when we feel we need to show some of these images. I don't know when that will be, but we talk about it all the time. SIMON: NPR's standards and practices editor, Mark Memmott. You can reach him, by the way, at wordmatters@npr.org. MEMMOTT: You're welcome. Transcript provided by NPR, Copyright NPR.